Both children and parents shook it up and stretched it out at the May 30th Move it Show. The Joe Ink workshop was stimulating and interactive for kids and allowed their parents to bring out their inner child as they joined in the live dance performance. Energetic lead dancers Jacci and Barb encouraged everyone to be a "super dancer" as they coached participants to follow the magic hand, do the robot or paint the bubble. 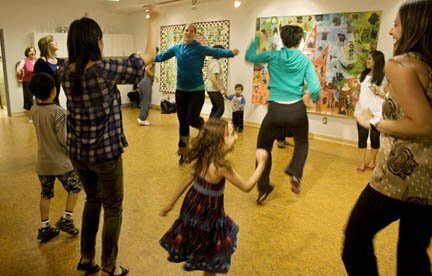 This workshop was part of the ArtStarts on Saturdays series, which take place on the last Saturday of the month at our downtown gallery and feature some of BC's top children's performers.